In recent years, the global jihadi movement has been in a state of flux. When the Islamic State declared a caliphate in 2014, took over large parts of Syria and Iraq, and thereby energized Islamist extremists worldwide, some predicted it would forever eclipse al-Qa`ida. But by provoking conflict with much of the rest of the world, the Islamic State rallied a powerful coalition against it. As a result, by mid-2016, the Islamic State’s territorial decline had become vast and visible, and counterterrorism analysts began to wonder if al-Qa`ida could gain back its position as the standard bearer of the global jihadi movement. Prior to that, the military gains of the Islamic State and the caliphate that it had established had cast doubt over the viability of al-Qa`ida’s more patient strategy. Rather than ideological differences between the groups softening, the passage of time is hardening differences in approach and doctrine, creating the conditions for sustained competition and acrimony between the groups and a long-term schism between two different schools of jihad. These differences became much more apparent during the Iraq insurgency. While professing loyalty, al-Zarqawi ignored the objections of al-Qa`ida top brass to pursue a campaign of sectarian bloodletting in Iraq. His successors, the leaders of the rebranded Islamic State of Iraq, maintained the group’s affiliation with al-Qa`ida, but only paid lip service to notion of juniority to al-Qa`ida’s high command. When al-Julani proposed the idea of expanding into Syria to his superiors, he included in the proposal an explanation of why the group needed to operate differently. Firstly, the insurgency in Iraq was a response to a foreign invasion, while the Syrian rebellion was a popular “revolution.” Secondly, Iraqi tribes were better socially organized and coherent than tribes in Syria. 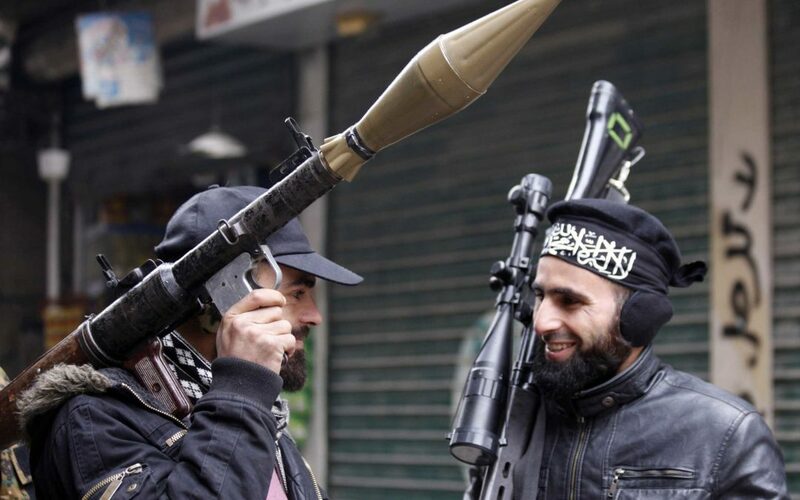 Thirdly, the Muslim Brotherhood had a weaker presence in Syria than in Iraq. Attempts to restrain the Islamic State in Iraq and Syria failed. As the rebels fought the regime on the frontlines, the group focused on establishing checkpoints, enforcing sharia, and began campaigns to expel Sunni rebels fighting Assad from areas they had previously taken from the regime, such as Raqqa, Deir ez-Zor, Aleppo, and Hasaka. Its tactics alienated the rebels and their supporters inside and outside Syria. It was during this period that derogatory labels against al-Baghdadi’s organization first appeared, including Daesh (an Arabic acronym meant pejoratively because it signifies harshness) and Khawarij (after an extremist group that emerged during Islam’s early days, described and condemned extensively in Islamic texts). The stunning military gains made by what was now called the Islamic State pushed al-Qa`ida loyalists in Syria into further disarray. The surging fortunes of al-Baghdadi’s group had come as a surprise to many. When al-Zawahiri had disavowed the Islamic State in February 2014, the Islamic State in Iraq and Syria group was embattled across Syria. It had been expelled from all of Deir ez-Zor by Jabhat al-Nusra and its allies, except for a small town between Deir ez-Zor and the Iraqi border. Similarly, al-Baghdadi’s group had been expelled from all areas in Idlib and most of Aleppo. And in May 2014, rebel groups had launched an offensive to oust the Islamic State in Iraq and Syria from its last fortress in Raqqa. Yet, in June 2014, al-Baghdadi’s group reversed most of its losses and went on the offensive in eastern and northern Syria, as well as in Iraq. With its military gains and proclaimed caliphate, the Islamic State started to morph into a competitor to al-Qa`ida for the leadership of global jihad, eventually directing, coordinating, and inspiring a series of terrorist attacks in Europe and other parts of the world. The transformation entrenched preexisting and long-running differences in tactics and vision between the two groups. These differences were not new; they merely came to the fore and were inflamed and aggravated by these developments. This move was a departure from Jabhat al-Nusra’s strategy of not imposing its ideology. In retrospect, the leak was possibly designed as a trial balloon to gauge interest in the idea within and outside of the organization, and the plan never materialized. In the leaked audio, al-Julani emphasized affinity with the Taliban leader Mullah Omar, al-Qa`ida, and acclaimed jihadi ideologues such as Abu Mohammed al-Maqdisi and Abu Qatada al-Filistini, who rejected the Islamic State’s caliphate declaration as counterproductive to jihad. As al-Qa`ida and the Islamic State weakened, both exhibited signs of internal tribulations. In July 2016, Jabhat al-Nusra changed its name to Jabhat Fateh al-Sham, an effort to merge with rebel groups and put distance between itself and al-Qa`ida. The nature of the rebranding is still a matter of debate among analysts tracking the group in Syria, but the consensus of the various parties directly involved can be summed up as follows: the group had agreed with al-Qa`ida’s representatives inside Syria to announce the severance of links to an external entity while maintaining a secret oath of allegiance to al-Zawahiri, akin to al-Qa`ida in Iraq’s move in 2006 to dissolve itself and form the Mujahideen Shura Council. In other words, the decision by Jabhat al-Nusra’s leadership to reject al-Zawahiri’s demands to reverse the rebranding and announce public links to his group was most likely informed by the same existential logic that led the group to reject al-Baghdadi’s merger/takeover in 2013. Arguably, if it had not been for the demands initiated by al-Zawahiri, relations between the two would unlikely have suffered. The two groups could mend fences, depending on how the situation unravels in the last rebel stronghold in northwestern Syria, where Jabhat al-Nusra now holds sway, and where al-Qa`ida and Hurras ad-Din continue to operate freely in Nusra-dominated areas. Although Hazimis constituted a small minority within the Islamic State and their ideas never became dominant, they briefly took over the group’s highest body, under al-Baghdadi, known as the Delegated Committee, until al-Baghdadi in 2017 reversed their control of that body. Since then, the Islamic State has made clear its rejection of the Hazimis’ ultra hardline interpretation of takfir, dampening the possibility the entire Islamic State group will fragment. Another reason the Islamic State and al-Qa`ida will likely remain distinct rival power centers is that these organizations, or their affiliates, previously stuck fast to their ideologies and strategies even during some of their most challenging times. The Islamic State, for example, continued to insist on fighting other jihadis and Islamists even though the militants were being pushed back from most of Syria in the early months of 2014. If it compromised and agreed to share influence in rebel-held areas, the group would have avoided the pushback from various militant factions, but instead insisted on its rigid ideology and aggressive tactics. Similarly, on the al-Qa`ida side of the ledger in 2013, Jabhat al-Nusra confronted its former leaders in Iraq because it believed publicly subordinating itself to Islamic State leaders in Iraq who originally set up their Syria venture would constitute operational suicide, and refused to compromise even while many of its fighters joined the al-Baghdadi faction. Such decisions during periods of extreme hardships highlight the profound convictions each of these groups has about its approach. This is unlikely to change in the coming years. Apart from rivalry and infighting, each of these groups also views its rival’s approach as flawed, ineffective, or limiting. Al-Qa`ida and its allies (including al-Julani’s group in Syria) believes the Islamic State’s aggressive methods alienate communities. The Islamic State considers al-Qa`ida and al-Julani’s approach of winning hearts dilutes the purity of the jihadi cause and failed each time it was tried, whether in Iraq when it was applied in the early years of the anti-U.S. insurgency before fellow insurgents turned against it, or in Syria when al-Qa`ida failed to dominate the anti-government rebellion, except in the northwest. Divergence over issues such as sectarian violence is another impediment for any rapprochement. The Islamic State views Shi`a as heretical and has openly declared war on them in places like Afghanistan, Yemen, Iraq, and Syria. Al-Qa`ida’s focus is most likely to be limited to recruiting disillusioned Islamic State members, rather than trying to reach a rapprochement with the Islamic State. This approach has been evident since al-Zawahiri’s statements in 2016, as the Islamic State began to weaken. An al-Qa`ida affiliate like Hurras ad-Din in Syria might be better positioned than others to attract Islamic State fighters, due to its affinity to the original founder of the Islamic State (al-Zarqawi) and his onetime mentor, al-Maqdisi. And the Islamic State seems to be concerned about this. Curiously, in a lead article in one of Al-Naba’s issues, the Islamic State labeled Hurras ad-Din as the “guardians of polytheism” and warned their own followers from “aligning with them in any form, until they repent from their apostasy.”44 The warning reflects a fear that such jihadis could attract members who might be operating in northwestern Syria, where Hurras ad-Din is based.m However, even if defections happen, they will likely be negligible in numbern and limited to members outside the group’s core, for two reasons. First, Hurras ad-Din’s reach is geographically limited to northwestern Syria. Second, judging from many years of disputes and conflicts, in Iraq and elsewhere, the defection of hardened Islamic State members to other groups is extremely rare. Simply put, sizable defections from the Islamic State to al-Qa`ida similar to the reverse ones that took place in 2014 are very unlikely. Since its declaration of a caliphate in 2014, the Islamic State has sought to dominate international jihad, unlike when it had acted under, and sought legitimacy from, al-Qa`ida in the years before that. This will no doubt continue. Aside from the fighting that has taken place between the two, each group continues to believe that its strategy is more effective, and each seeks to dominate the other to establish itself as the leader of global jihad.